Aaaaaaaah! September is *finally* here. After a scorching summer I’m ready for at least a slight drop in the temperatures. If that happens, hiking will be a pleasure again! Keep in mind that if you’ve purchased a Cinque Terre Card then the scheduled tours and excursions are free for you! If you don’t have the Cinque Terre Card you can still participate at the price of €6.50 per person. 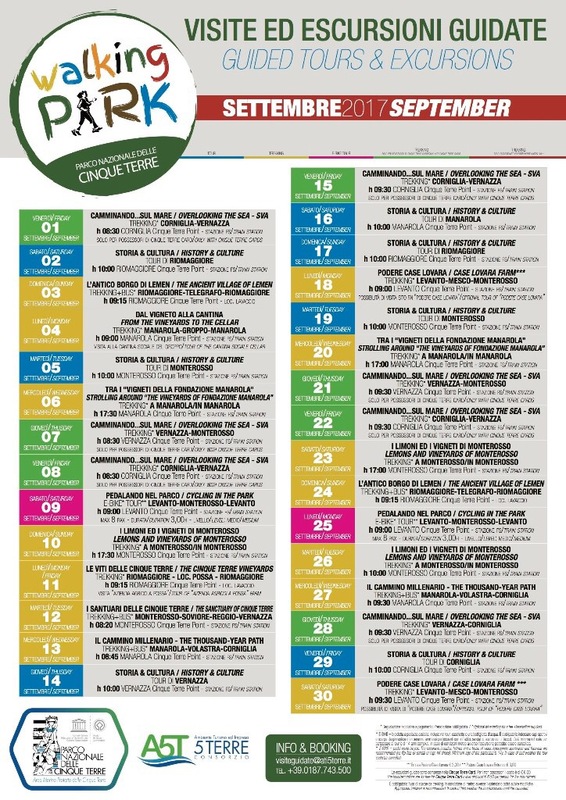 The Cinque Terre Walking Park calendar is color coded so I’ve created a key for you. First, look at your interested date(s) on the calendar above and then take note of the color for that day. RED = Expert hikers, only. For Septembe, there are currently no red dates on the schedule.